Women Veteran Program Managers are available at each VA Medical Center nationwide to assist women Veterans and coordinate services. Women Veterans who are interested in receiving care at VA should contact the nearest VA Medical Center. 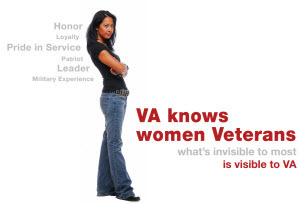 Women Veterans are assigned to a designated Women’s Health Primary Care Provider who can provide general primary care and is specially trained or experienced in women’s care. VA’s Whole Health System offers women Veterans proactive and personalized health care—empowering you to achieve your greatest level of health and well-being. Whole Health means the Whole You. From integrative health approaches like stress reduction, nutrition, and health coaching, to traditional clinical care and complementary health approaches—your journey to Whole Health starts here. You will be at the center of a Patient Aligned Care Team (PACT). A provider, nurse, and others will engage with you to manage your health care. VA referrals are given to those in need of rehabilitation therapies, such as physical therapy, occupational therapy, speech-language therapy, exercise therapy, recreational therapy, and vocational therapy.